Want to celebrate National Crab Meat Day in Las Vegas? It's National Crab Meat Day on March 9 and despite the fact that Las Vegas is located in a desert, there is plenty of crab to be found. Marilyn’s Cafe will be celebrating National Crab Meat Day on March 9 with a crabtastic evening of giveaways, photo opportunities with the Crab King, and Marilyn Cafe’s famous all-you-can-eat crab dinner for $23.99. 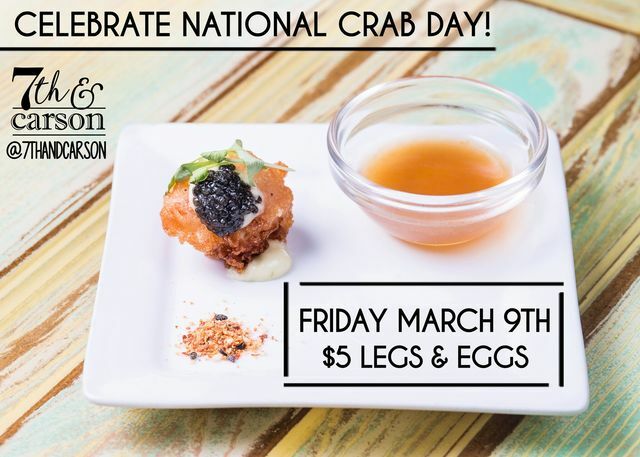 7th & Carson in Downtown Las Vegas will be celebrating National Crab Meat Day with $5 Legs & Eggs, which features tempura King crab, caviar and barrel ponzu. No lack of choices at The Boiling Crab. There's blue crab, Dungeness crab, king crab legs, southern king crab legs and soft shell crab. Hot N Juicy Crawfish serves much more than crawfish. They also have snow crab, shrimp, lobster and calamari. The colossal lump crab cake at Joe's Seafood, Prime Steak & Stone Crab is delicious. There's also crab bisque, stone crab, crab stuffed shrimp, Alaskan King crab legs, and an Alaskan King crab roll. Seafood is the first thing you see at Bacchanal Buffet at Caesars Palace. In addition to crab legs, the buffet also as lump crab avocado toast. It's all about seafood Fridays through Sundays at Studio B Buffet at M Resort. There's no lack of crab legs. You'll love the crab legs at The Buffet at Wynn Las Vegas. Almost as much as you'll love the buffet room. It's a sight to behold. Masto's Ocean Club at Cr offers a Dungeness crab cocktail, chilled Alaskan King crab legs,and Alaskan Red King crab claws. Let your tastebuds guide you. The seafood is flown in daily for Rick Moonen's RM Seafood at Mandalay Bay. The shellfish platter, available in small, large and kitchen sink, features crab, lobster, shrimp, oysters, clams and mussels. The crab duo features 1/2 pound of steamed Alaskan King crab and Rick's signature crab cake. The crab legs at Wicked Spoon are a good choice. And best of all, they are already split for the customer. Enjoy a lump blue crab cake served on a bed of mixed greens and drizzled with a lemon garlic aioli sauce. Or try to deep-fried soft-shell crab. The Oyster Bar serves up a lump crab cocktail and its crab pan roast is a customer favorite. Unique crab offerings here include the Annapolis crab dip, a crab pretzel, mini crab cakes, and a soft-shell crab sandwich made with prime soft shells from the Chesapeake Bay. The jumbo lump crab cakes at The Palm inside Forum Shops at Caesars Palace are served with jicama slaw and Old Bay aioli. You can also order jumbo crab over grilled romaine hearts with a charred lemon vinaigrette. Shuck's Tavern & Oyster Bar serves Snow crab and Dungeness crab in a bucket. They also have a crab cocktail and crab and spinach dip. The Alaskan King crab cocktail at the Golden Steer Steakhouse is delightful. Their Alaskan King crab legs are also broiled to perfection. The Big Easy Sampler includes crab cakes, frog legs, alligator tail and oysters. They also have a lump "Bleu Crab" cake. Alaskan snow crab is served steaming hot with drawn butter. Crab legs are one of the many offerings during dinner at Makino Sushi & Seafood Buffet. You can pile your plate high with Snow crab legs at Carnival World & Seafood Buffet at Rio hotel0-casino. We aren't sure what they mean but the Hush Puppy says it is home to the "Las Vegas crab legs." Wait for dinner if you want crab legs at The Buffet at Bellagio. You won't be sorry. And it's one of the prettiest rooms in town. For a limited time, Rampart Casino is offering a seafood and crab legs buffet on Fridays and Saturdays. Enjoy as many crab legs as you want at The Buffet at ARIA. KRAZY Buffet is probably one of the best inexpensive Chinese buffets in the city. Crab legs are offered during the dinner period. The seafood platter features lobster, Alaskan King crab, lump crab, oysters and shrimp. They also offer crab chowder and Alaskan King crab legs. You'll enjoy eating the Snow crab legs at Le Village Buffet. The Fresh Buffet at Westgate describes their crab legs as mouth watering. The champagne brunch on Saturdays and Sundays includes chilled crab legs. Don't forget to grab some crab legs in the colorful Garden Buffet at South Point. Emeril's New Orleans Fish House in the MGM Grand offers a jumbo lump crab cake with lemon aioli ($25). Or, try th rainbow trout with a jumbo lump crab, haricot vert, cherry tomatoes and chive beurre blanc ($34).